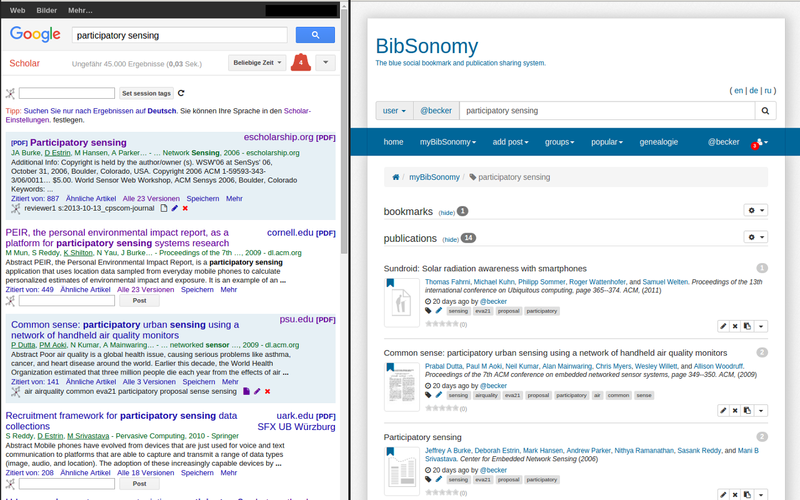 A while ago I was working on a Chrome browser extension for integrating BibSonomy, a social bookmarking and publication management platform, with the Google Chrome browser. The idea was to directly manage publication on the Google Scholar page without the cumbersome process of getting the BibTex, opening BibSonomy, pasting the BibTex, downloading the PDF, uploading the PDF … you get my point. BibSonomy Scholar integrating with Google Scholar. After a while, I came across the issue of choosing a new laptop, having a million tabs open, clicking through them again and again, trying to remember which laptop an which page was the one I was interested in and why. So I thought that adding tags to URLs for a better categorization of my reviewed laptops and leaving notes on each page would be a tremendous help. While I know that Firefox supports tagging of bookmarks and I guess that there are quite a few browser extensions to support leaving notes, I did not want to get started with yet another system for managing things. So, since BibSonomy actually supports adding tags and descriptions for bookmarks, I added a “Quick Bookmark Button” to the BibSonomy Scholar extension. Overall, I think that the BibSonomy Scholar extension can be quite helpful and allows for a very “integrated” experience of BibSonomy. Of course I see many things which can still be improved and even more features which would be nice to implement. For example, all publications and bookmarks posted are public for now. Especially for bookmarks, this might not always be the desired option. Concerning additional features, I think it would be nice to handle pages from publishers containing publications differently than regular bookmarks, i.e., indicating if the corresponding publication has already been posted, or directly posting this publication instead of a bookmark. There are many more ideas floating around. I hope to find the time to add them at some point. Finally, if you want to try out the extension have a look in the chrome web store and let me know about your experience with the extension. Also do not hesitate to post bug reports or feature requests or contribute yourself. The extension is open source and can be forked on Bitbucket. I will be happy to accept push request. “Bagging based on resampling with and without replacement is equivalent”, is it?